Alison Shaffer: Who's ready for Pumpkin Season? 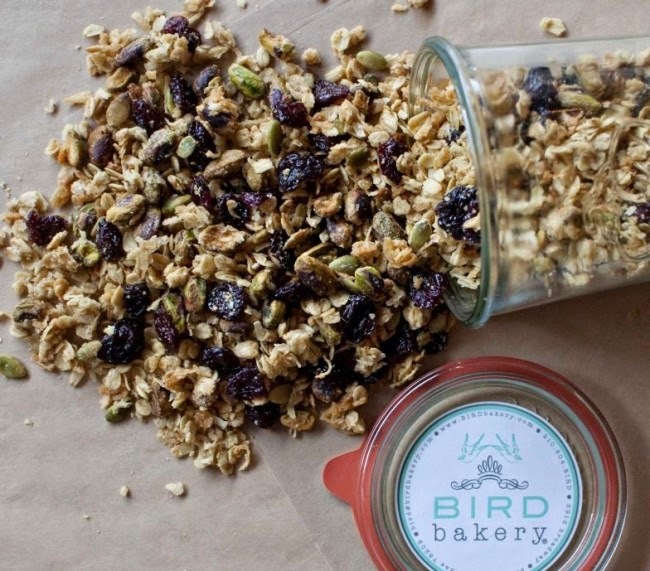 Bird Bakery has the perfect Granola recipe just for you! Who's ready for Pumpkin Season? Bird Bakery has the perfect Granola recipe just for you! Who's ready for Pumpkin season! This granola recipe from Bird Bakery Granola will get you carving that pumpkin and saving the seeds to make this tasty granola. With major tastes from oats, coconut flakes, pumpkin seeds, cherries, and maple syrup you might have it for breakfast but find yourself adding it to you lunch time yogurt or cottage cheese. Read on and crunch on with this perfect Autumn recipe from Bird Bakery. Follow Bird Bakery on Pinterest for lots more yummy photos. our granola is the perfect combination of salty and sweet." it nearly impossible to resist." Heat oven to 275°. Line two baking sheets with parchment; set aside. In a large bowl, mix together oats, coconut, pistachios, pumpkin seeds and sea salt. set aside. In a small saucepan, combine sugar, maple syrup and olive oil, stirring over low heat until the sugar dissolves completely. pour over oat mixture. Stir well. Bake until golden, about 20-25 minutes, rotating pan once at 10 minutes. Cool at room temperature. Break up granola; sprinkle with dried cherries. store in an airtight container. Enjoy! Serve warm to the family when they arrive home from school or work!